Annual potatoes (Solanum tuberosum) are typically associated with russet potatoes used for french fries and for baking. Russets are grown in Idaho and the Pacific Northwest. But planting most cultivars of russet potatoes in Florida is not a good idea. The first step in successfully planting and growing potatoes in the Sunshine State is to select a cultivar that is appropriate for Florida's climate. 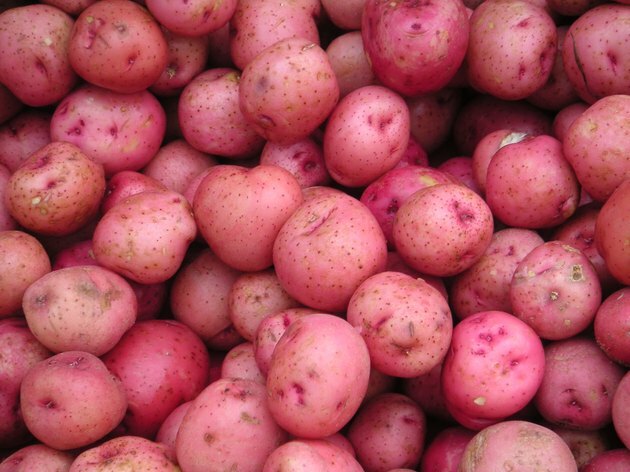 Several red skin potato varieties are suitable for Florida gardens. A white-skinned potato with white flesh, 'LaChipper' grows well in Florida winters. A traditional Florida variety, 'Sebago' is a round to oblong white potato with shallow eyes and exceptional flavor. A round, yellow to white potato with shallow eyes, 'Yukon Gold' has great-tasting yellow flesh. The smooth, bright red-skinned 'Red LaSoda,' a favorite for growing in North Florida, is harvested in winter. The red potato of choice for South Florida, the round 'LaRouge' has smooth skin, relatively deep eyes and gives a moderate to high yield. A russet potato that does well in Florida's climate is the brown to dark brown 'Russet Norkotah,' a good baking potato. Do not attempt to plant potatoes that you buy in a grocery store. These may carry potato diseases and are sometimes treated with chemicals to prevent them from sprouting. Buy seed potatoes certified to be free of viruses and disease from a reputable garden supply center. Potatoes grow from buds in the dimples on potatoes. These are called eyes. Potatoes are naturally dormant after they are harvested. Seed potatoes have to be stored at room temperature in light for a few days to break dormancy. Plant potatoes in an area with full sun from September to January in South Florida and from January through March in Central and North Florida. Because potatoes like well-drained, loose soil with a pH of 5 to 6, they do well in most Florida soils; however, they don't like to be flooded. 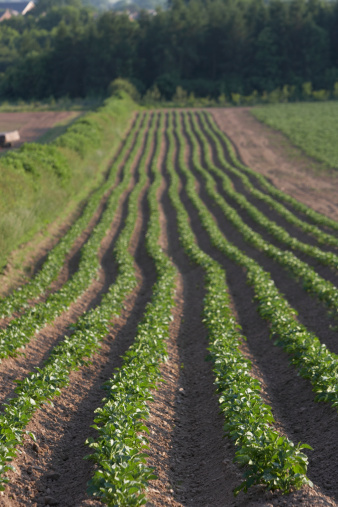 To avoid having potatoes sit in standing water, plant them in hills 10 to 12 inches above the surrounding soil. Add water as needed to keep the plants moderately moist since they will be growing during the state's dry season. 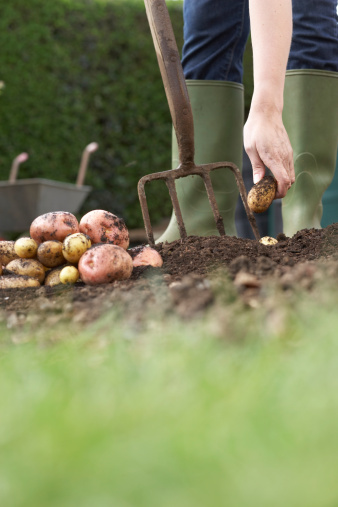 Work 7 1/2 pounds of 10-0-10 fertilizer into the top 6 inches of soil per 100 feet of soil before you plant potatoes. Use a sterile knife to cut the seed potatoes into pieces about the size of an egg, each with at least one eye. Leave a seed pieces in a dark, well-ventilated location at 60 to 65 degrees Fahrenheit for one or two days so the wounds cut can heal. To sterilize a knife, soak the blade for five minutes in a solution of 1 part household bleach to 3 parts of water. Let it air-dry. Plant the seed pieces with the cut sides down and the eyes or developing sprouts facing up 4 inches below the soil and 6 to 8 inches apart. Leave 36 inches between rows of potatoes. Sunlight turns exposed potatoes green, rendering them inedible. Move soil from between furrows to add from 2 to 3 inches of soil on the row when the sprouts emerge. This is called hilling.